IMPORTANT UPDATE: JOHN IS JUMPING into Normandy, France. Please view the updates tab for all new information regarding this project! Thank you for taking the time to review this film project. On the 75th anniversary of D-Day, we’ll be going on an adventure with a group of veterans from the United States Army’s 75th Ranger Regiment to document their journey through history. This project presents a golden anniversary for these soldiers and we are going to seize the opportunity to tell the story. In this film project’s description, you will find a story that is both engaging and historic. We have placed an emphasis on making the content we capture from this project apply to many audiences across the globe. We are combining culture, history, and travel locations that will truly inspire viewers to learn more about our shared past. With your help, we can bring this project to life. Your donation will go directly to the film production for this project. Hitting our goal for this project allows us to provide plane tickets, lodging, production equipment, and crew stipends that will elevate the level of production and cinematic quality of this project. On the 75th Anniversary of D-Day, retired US Army Ranger and Special Forces Sergeant Major John “Shrek” McPhee will visit historic WWII sites with 12 other of his close US Army Ranger friends to retrace the footsteps of the original Rangers and Paratroopers. At the end of this adventure, John will be demonstrating the D-day paratrooper jump with the Liberty Jump Team . John "Shrek" McPhee is a veteran of 1st Ranger Battalion, and will travel to the original training site of the US Army Rangers in Carrickfergus, Ireland, to describe the training and obstacles that WWII Army Rangers endured. As the host, he will provide a stark contrast between his experiences in Iraq and Afghanistan where he served as a Special Operations Sergeant Major, in the most elite unit of the military. In creating this film project, John will visit historic locations through Ireland and France to find out what it really took to jump out of a plane behind enemy lines on D-Day. The culmination of history, current war efforts, and a climactic skydiving finale will result in an epic viewing experience that will only happen once for Army Rangers on their 75th anniversary of Operation Overlord aka D-Day. Sergeant Major (ret) John McPhee AKA “The Sheriff of Baghdad” served a distinguished career in U.S. Army Special Operations for over 20 years, retiring in 2011. Better known for his call sign “SHREK”, John has spent his adult life in Special Operations and Special Mission Units. 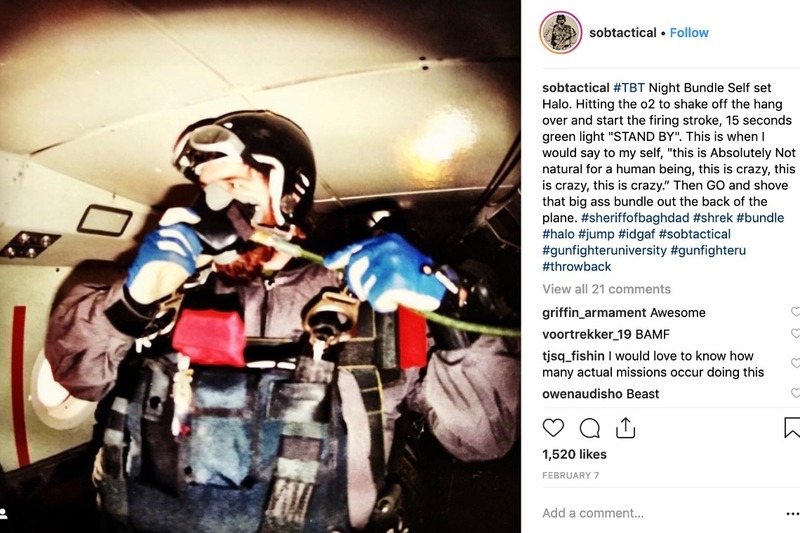 His career path was as follows: 1st Ranger Battalion, Special Forces (green beret), and Delta Force, and retired at the highest enlisted rank of Sergeant Major. He is one of a handful of operators with over a decade of combat experience. His work has been written about in major modern combat books like Kill Bin Laden, Modern American Sniper, and Guns of the Special Forces. 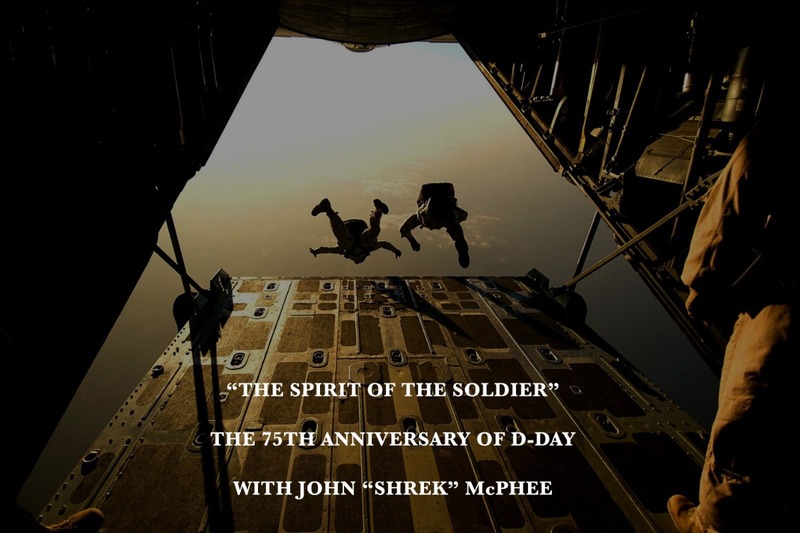 THEME: "SPIRIT OF THE SOLDIER"
Who is our host John “Shrek” McPhee? Where has he been during his military career? Where is the birthplace of US Army Rangers? Why are we here in Ireland? What is the significance of recreating the D-Day jump? What was worth fighting for then vs. now? How were soldiers different during WWII vs. now? What obstacles both physically and mentally did soldiers face in each time period? What did it take to jump out of a plane then vs. now from a technology and courage standpoint? Why is John “Shrek” McPhee jumping out of the plane to re-create history? When was his last jump? Who are the other rangers and WWII veterans John is traveling with? What were the thoughts of WWII soldiers the night before their D-Day jump? 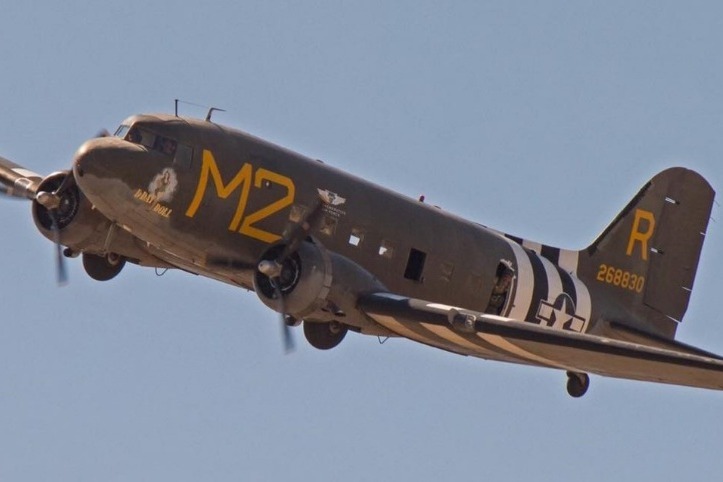 What are the conditions of the C47’s used to re-create the jump? In the finale, we see the current and former Rangers jump, to hopefully include John “Shrek” McPhee and we will honor those who gave their lives on June 6, 1944. Carrickfergus, North Ireland - The birthplace of the prestigious US Army Rangers and their initial training ground. Cliffs Of Moher - Hitler’s plan for Ireland included coastal defenses on the Cliffs of Moher. These beautiful landscapes provide a rich history and stunning views. Guinness Brewery - In the long run-up to D-Day in June 1944, the British periodically agreed to release stocks of wheat, coal, fertilizers and agricultural machinery in exchange for Guinness to be supplied to the dry-tongued Americans and Brits. Castle Archdale - This Irish castle housed up to 2,500 people and was a major base during WWII. Normandy Landings - Beaches across Normandy and the cliffs the Rangers scaled in order to secure safe landing for allied troops. Mont Saint Michel - Since ancient times, this island has been a fortress and is currently a UNESCO world heritage site. It served as an AXIS stronghold during WWII. Pointe Du Hoc - A key US Army Ranger victory during D-Day. Rangers eliminated AXIS artillery units threatening allied troops. Scattered Drop Locations - French Countryside where paratroopers missed drop zones and landings. It was pure chaos on D-Day for paratroopers. Interested in having your brand featured in the film project? Varying levels of sponsorship are available. Please contact josh@taprootpictures.com. A documentary film with no determined length to be produced. *Anything above $75k will be used to pay additional specialized film production crew members to create even more cinematic shots. Such as a tandem cameraman (skydiving cameraman), director of photography, production coordinators, aerial cinematographers, etc. It would be an honor to share this story with you. We have a deep sense of responsibility for this project and feel that we are the right people to bring this to life. We will be honoring those who have fought to keep the world safe from evil, while also providing an engaging historical journey to viewers worldwide. It is truly a special opportunity. With your help, we can make this an amazing cinematic journey that we all can be truly proud of! We are exactly 50 days out from the start of our video production for this project. I couldn't be more thankful for all of your support. Here is a video of a practice jump I had to complete in order to jump into Normandy, France in June. I did this at Ft. Benning in Georgia and was welcomed by the future of the US Army's Airborne. It was great to see everyone and tell them about what we'll be documenting this year. If you haven't shared the campaign yet, please do so, we have a long way to our goal, and we hope that we're able to document this historic anniversary to it's fullest potential! We're halfway through our campaign and we cannot thank everyone enough for your support! This week I am heading to a practice jump at Fort Benning to make sure everything works when I get over to Normandy. 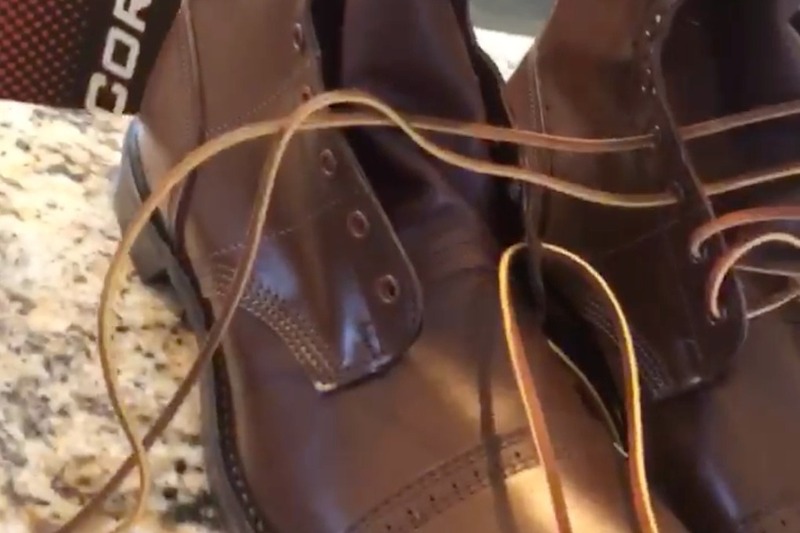 I just received my static line parachute and my boots (pic below). I'm still waiting on my authentic WWII airborne uniform (Should be here soon). The D-Day re-enactment jump is just one part of the story. There is so much more history that we'll be documenting. In Ireland, we'll be visiting the original training grounds of the Rangers, and in France we'll be sharing the history of Normandy with a Ranger Hall of Fame'r. We'll share more as we continue pre-production. Truly this history is worth preserving and we'll be documenting every step of the way. We're getting closer to our goal each week. Please continue to spread the word and share this with people who value the history we are trying to preserve! We're almost two weeks in to this campaign and we're getting closer everyday. Thank you to everyone who has given their hard earned money to this project. I feel that preserving this history is of the utmost importance. To me the theme of this project the "Spirit of the Soldier" means more than just jumping out of the plane to honor the soldiers. To me, this project represents an opportunity to speak with WWII veterans at the battlegrounds they fought on, possibly one of the last times that anyone will be able to. It will be an honor to be in their presence and I believe we will be able to do this history justice through the documentary content that we will create. Thanks to everyone who has donated and shared this campaign. Please continue to do so, as we are close to hitting our first goal of $10,000. The production company we have hired to create this content is well versed in documentary work and we are hoping to reach a higher goal in order to hire more specialized crew members that will provide higher production values to this project. *Here's an old photo of me from Instagram. Right before jumping out of a plane for training purposes years ago. Can't wait to do it again in June! The first week of this campaign was nothing short of a success. THANK YOU to everyone who has supported this project with your generous donations and sharing. We're getting closer everyday to reaching our goal and it could not be done without out. As you can see at the end of this description we have specific goals that will influence the level of production we are able to achieve. If you haven't yet, please consider sharing this project with your friends and family so that we may document this journey at the highest level possible, and preserve this history the way that it is meant to be.